Not everyone wants their embarrassing baby pictures circulating through their friends, the Internet, or NASA headquarters. Planets are just like those people and most of them do a good job of keeping their baby pictures from getting in the hands of the astronomical community. They are also good at concealing their presence from the most common methods for detecting exoplanets. Baby planets can never be seen transiting their stars as long as they can hide in a circumstellar disk of gas and dust that is continually “transiting” their stars along with them. Meanwhile, they do not have to worry about being found through their tug on their parent stars since these young stars are still too variable to allow a precise radial velocity measurement before they reach the main sequence. Although astronomers may not be able to convince parent stars to announce the births of their youngest planets before they turn 10 (million years old, that is), there is still hope of finding proof these planets exist by watching what they do to their neighborhood disks after they are born. Even if we cannot see baby planets directly, we can observe how much space they need to clear out for themselves and also see what happens when they smash their toys together, both healthy signs that a young planet is alive and growing up. Young planets need space growing up in a crowded disk. Jupiter-mass planets in particular clear out vast amounts of gas in the disk to open up wide ring-shaped gaps. Figure 1. 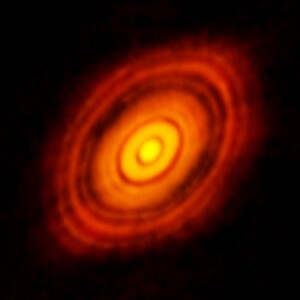 ALMA’s image of HL Tau with five visible gaps. Which gaps have planets? Although giant planets can create gaps in circumstellar disks, planets are not responsible for every gap. The HL Tau system famously imaged by ALMA would quickly become unstable if every gap in the image harbored a giant planet. This inconsistency led to various attempts to model how many planets are needed to explain the gaps, along with follow-up observations to search for the system’s largest planets. How can we tell which gaps have planets if we cannot see the planets that created them? Young planets have lots of planetesimals to play with in their surrounding circumstellar disk. The only way these planets know how to play with their planetesimal toys is to smash them together. When there is no planet in the disk, planetesimals calmly orbit their star at roughly the same speed at any given radius due to Kepler’s 3rd law. A nearby planet will break this tranquility by perturbing the planetesimals enough to cause them to collide with each other at a much higher rate. These added collisions create a new generation of dust in the disk. Even though nearly all of the mass in a protoplanetary disk comes from its gas, telescope arrays like ALMA primarily observe the more secondary dust component in their images. Extra dust from planetesimal collisions might create a signature near a gap that could only come from the presence of a planet – which in turn, ALMA can observe! Figure 2. Two collision types with time advancing to the right. Top (A-D) shows a hit-and-run where two colliders graze each other and change directions without losing mass. Bottom (E-H) shows an erosion collision where one collider loses mass. Image Credit. Collisions can be very difficult to model in simulations. A disk is made up of millions of planetesimals spanning a wide range of different masses, shapes, sizes, structural integrities, and trajectories. Modeling each individual collision realistically requires calculating how the planetesimals will fragment or coalesce along with the orbits of each resulting fragment. With so many collisions, this takes a very long time to compute. In this paper, the authors get around that issue by sorting each collision into different regimes depending on the properties of the colliders. These regimes include perfect merging – where the two colliders simply merge, and super-catastrophic – a high-speed collision where the largest remaining fragment is much smaller than either collider. Two other collision types are shown in Figure 2. Depending on the type of collision, their model can then predict the outcome without worrying about the structure of the colliders during the collision. This saves the authors a lot of time and allows them to run their simulations for 20,000 years – 20 times longer than in their previous paper where they used a different collision model. Figure 3. Planet in an eccentric orbit. Left shows the gas distribution in the disk at 20000 yr. The dashed line indicates the planet’s orbit with an eccentricity of 0.2. There is a clear gap (black) where there is no gas near the planet. Right shows what ALMA would see. The dust fills the gap, hiding evidence that a planet is there, instead of revealing it. From the paper. The authors run a suite of simulations in which they place a Jupiter-mass planet in a disk of gas and planetesimals. 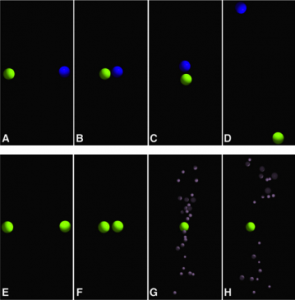 They simulate the distribution of planetesimals over time using N-body dynamics and their collision model, the distribution of gas using hydrodynamics, and the distribution of dust from collisions by estimating a decay rate at which it disappears. After the authors evolve the disk, they determine what the disk looks like to see if they can find evidence that the planet is there. They use a radiative transfer code to calculate how much radiation the gas and the dust will emit at different wavelengths. From those radiation spectra, they construct images of what a telescope array like ALMA would see. Figure 4. Planet in a circular orbit. 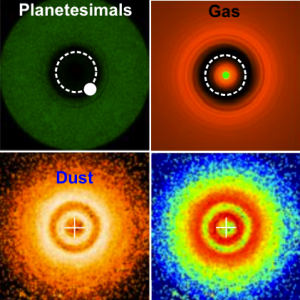 The three simulated components of the disk (planetesimals, gas, and dust) are shown at 20000 yr. The bottom-right panel shows what ALMA would see. The dust dominates the image and the double ring gives away the presence of a planet hiding in the gap between the rings. Adapted from the paper. Their resulting images are shown in Figures 3 and 4. If the planet has an orbit with an eccentricity as low as 0.1, the extra dust fills the gap the planet created, making it difficult to distinguish from a disk with no gap (Figure 3). Fortunately, planets on circular orbits cannot hide! They create a double-ring structure that clearly stands out from a generic disk (Figure 4). The authors note that ALMA should be able to observe this double-ringed signature, provided the disk is not so young that its initial gas and dust still dominate the image. If ALMA observes a double ring in a disk, it would be a great place to conduct a follow-up search for planets. If they are found, they would be some of the first observations of baby planets (like these recently discovered ones). We could use these observations to learn how long it takes for planets to form. These constraints would greatly improve existing theories of how baby planets are born (better known as planet formation). Missing Spirals and Forming Planets Sneak a peek on the cause of death of protoplanetary disks Forming Rings in a Protoplanetary Disk Circumplanetary disks… soon!